UK Study: Conservatives have larger ‘fear center’ in brain Political opinions are considered choices, and in Western democracies the right to choose one's opinions -- freedom of conscience -- is considered sacrosanct. But recent studies suggest that our brains and genes may be a major determining factor in the views we hold. 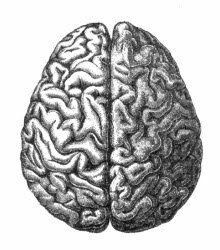 A study at University College London in the UK has found that conservatives' brains have larger amygdalas than the brains of liberals. Amygdalas are responsible for fear and other "primitive" emotions. At the same time, conservatives' brains were also found to have a smaller anterior cingulate -- the part of the brain responsible for courage and optimism. "It is very significant because it does suggest there is something about political attitudes that are either encoded in our brain structure through our experience or that our brain structure in some way determines or results in our political attitudes," Geraint Rees, the neurologist who carried out the study, told the media.